The Remnant Kings are teaming up with a wide variety of musicians to form a make-shift orchestra, including keyboard, tin whistle, violin, percussion, harmonica and trombone. Despite their drummer, Kit, being away on holiday The Remnant Kings didn’t want to turn down the invitation to perform at the launch night of their management company, Ginger Music Promotions, at Electric Circus in September, and so chose to rework some of their songs into an acoustic set, and invited Garry Hall and Alex Targowski from folk band Gallus, and long-time collaborator Fraser Yuill Scott, formerly of Yuill Scott and The Haight, currently of The Psycho Hearts, to perform with them. 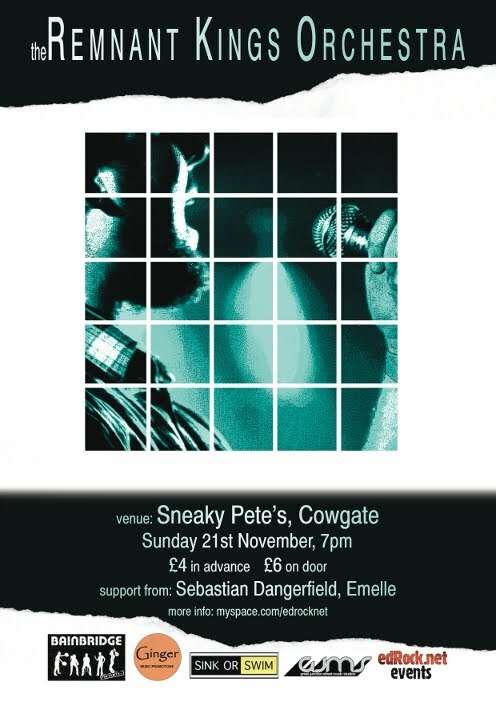 The band were so pleased with the way the songs sounded with the additional instrumentation, that they have decided to take it to the next level, and invite even more musicians to join in on their Sneaky Pete’s headline show on Sun 21st Nov. 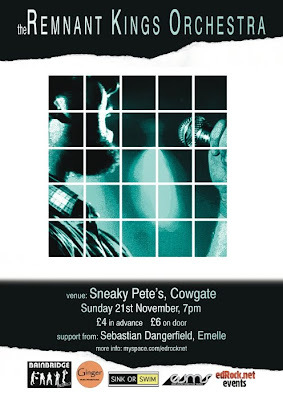 The show will include support from Sebastian Dangerfield, who recently supported We Were Promised Jetpacks; and Leith-based gypsy punks Emelle. The night is being promoted by edRock.net Events, and sponsored by Bainbridge Music and Great Junction Street Music Studios. Tickets are available now for £4 from TicketWeb, from The Remnant Kings, or from Great Junction Street Music Studios. On Turbo Blanc's (pictured) debut single 'Waiting Game', the four-piece take the drama of bands like Muse and Queen, a melody line and harmony that are almost baroque in their theatrical nature, with a more modern electric instrumental kick; gliding guitar and powerful pulse-rhythm bass. This track could easily come from the second act of a rock opera. 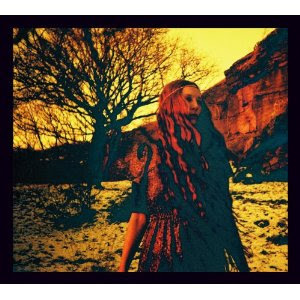 The band are releasing this track ahead of their debut album, due out in 2011. The band’s drummer, Virgil, controls the dynamic, moving from a standard rock beat to a more complex rhythm, and building to a crescendo. Lead singer Nik sings “I blame myself, in the absence of anyone else” in a sorrowful, regretful tone. As the song reaches its peak, influences of Elbow and Manic Street Preachers are revealed, mixing with Turbo Blanc’s clear 70s classic rock heritage. It isn’t quite the Meatloaf-esque rock explosion that represents the pinnacle of this style, but could stand tall beside the more dramatic Snow Patrol tracks without losing its nerve. The single is out now on the Fuzzbox Records label. Deep Red Sky combine an indie-rock sound with some all-the-rage synthesiser parts to create a sort of modern pop fusion. The band stepped in at the last minute to replace Bainbridge darlings Underclass, but unfortunately they proved to be an unworthy surrogate. A young band, they have yet to find their own sound, and their songs are uninspiring imitations of whatever’s on the radio. Their cover of MGMT’s Kids manages only to highlight that they are scene-chasing and not doing a good job of it. The lads were far from awful, though, and they performed their uninteresting music with competence and positivity. Jump: Press A (photo by FourthEye) have a 4:2 ratio of girls to boys. A more sexist person than I might cite this as the reason that the band have rather stylishly all dressed in various costumes consisting only of the colours red and black, and could cite the same reason for the fact that their set is plagued with technical difficulties. However, as an enlightened essayist, I would like to point out that the tech problems were with the bass and acoustic guitar, the two instruments operated by dudes, and the girls were responsible for electric guitar, electric piano, drums, and lead vocals. 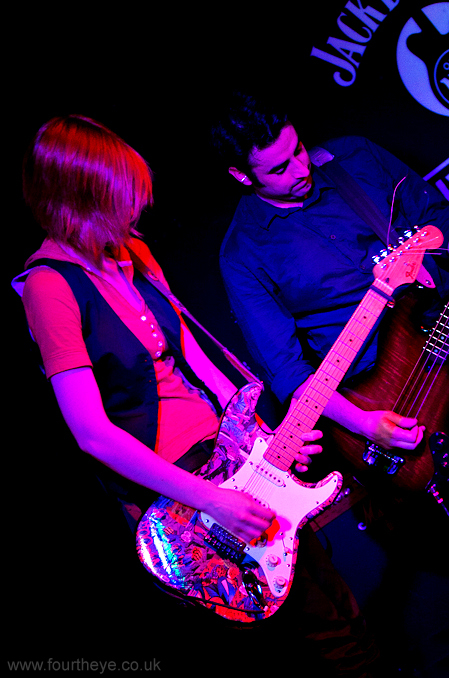 Between the six of them, the band create a rather full-sized, grand sound, suited to the medium-paced rock epics they perform: a sound that takes influence from glitzy polished post-grunge femme-fronted bands like Garbage and Republica, as well as components of thinking man’s indie like Radiohead or Elbow. Some highlights of the set are singer Kelagh’s Alanis Moriesette-esque melody on ‘You Are’, L-A’s classical piano sound on ‘Only The Brave Deserve The Fair’, and bright red-haired guitarist Lesley’s feisty guitar work throughout the set. With Underclass out of the picture, the headline slot was awarded to odd pop, scene- veteran five-piece Cancel The Astronauts. Their witty, verging on silly lyrics and vocals put a smile on your face, and their bouncy Vampire Weekendy indie-pop with synthy kinks makes your foot tap. The dual guitars chime and dither through quiet drums that are sometimes relaxed and other times invoke Futurehead-like angles. Compared to the other two bands on the bill, Cancel The Astronauts certainly come across as the elder statesmen (read: they’re older than the other bands) and they have certainly carved their mark in the Scottish scene. So it’s not surprising to see a well-performed and polished performance. Perhaps they’re a little too quirky for the mainstream, but their dysfunction-pop is loveable and something that critics and music fans can get behind. The Steals’ debut album, ‘Static Kingdom ’, is the soundtrack to a cartographer’s voyage of discovery into lands unknown. Lead singer Jayn Hanna’s delay-effected vocals float like a gentle breeze over the rolling hills of guitar riffs, glowing with chorus and reverb effects. Ironically these modern digital sound enhancement technologies make the listener feel like they have been transported to the past. A smattering of snare brushings or bongo tapping provide the percussive backdrop, as the ambient guitar and misty vocals paint the foreground. While the first three tracks, ‘Hope ’, ‘Shelter ’ and ‘The Weight ’ are summer afternoon light-spirited tunes at various tempos, the album’s flow then takes a turn down a darker stream. ‘Dead Flame Rising ’ has an after-dark eeriness and ‘Stay In Silence ’ has a strong tribal potency. At almost nine minutes long, ‘Golden ’ loses its way somewhat, without enough of a stable refrain to return to, this prog rock song has lost the listener’s attention half way through. This attention is re-ensnared, though, as ‘Borderlines ’ slowly swells to a crescendo. ‘All Coming Back ’ represents probably the most commercially viable track on the album, which is still a far stretch from a typical pop song. All–in-all, ‘Static Kingdom’ is a good representation of the dynamics that The Steals can achieve within their folk-ambient subgenre, but while the album has its high points, it fails to capture the hypnotic quality and sense of both guilt and serenity created by their previous release, the ‘Floodlights’ EP. Open Til Midnight is a downloadable pre-recorded webcast featuring a Scotsman and a Californian talking about local music and mainstream movies. It is presented by music journalist, musician and promoter Myke Hall, head writer and webmaster of edRock.net, and California-born Danielle Mattison, music lover, editor/photographer for edRock.net and walking IMDB. The Open Til Midnight webcast began as a forum for Myke and Danielle’s obsessive natters about movies, and a showcase of local music tracks. The show has since expanded to include downloadable alternative DVD commentaries and festival reviews, recorded on location. All episodes of the show are currently available to download or stream at OpenTilMidnight.co.uk. Now Open Til Midnight can now also be heard live on Fresh Air, Edinburgh’s student radio station. In addition to the usual movie reviews and discussion, the live show will also play host to local bands live in the studio for interviews and acoustic sets, and the latest movie news. Open Til Midnight is broadcast on Fresh Air’s streaming media service (freshair.org.uk), every Tuesday from 17:00 to 18:00, and will also be available for streaming and download from OpenTilMidnight.co.uk one week after the live broadcast. You can also keep up with Open Til Midnight on Facebook or Twitter.